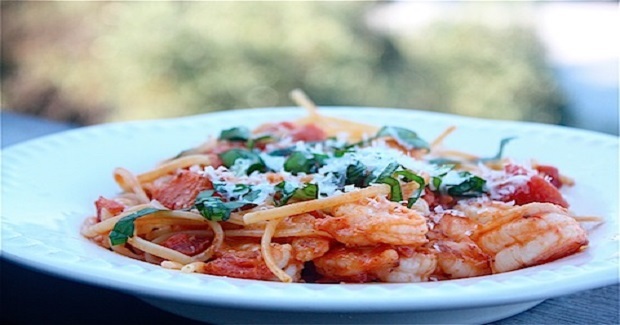 Linguine With Shrimp And Tomato Cream Sauce Recipe - Gutom Na! Posted on Thursday, October 27th, 2016 at 7:05 am. Cook the pasta in boiling salted water. Drain and set aside, reserving about a half cup of the cooking water. Heat a cast iron skillet to high heat, adding the oil once the pan is hot. Quickly add the shrimp and cook for about fifteen to twenty seconds, just till the tails start to curl upwards. Immediately add the garlic and saute for about ten more seconds. Now, add the diced tomatoes and heavy cream and stir everything together. Add back the cooked pasta to the pan and add a little of the reserved cooking water to combat dryness. Sprinkle with sea salt, pepper and red pepper flakes to taste. Serve with basil and Parmesan cheese.